Payment is required to hold your date and time. Please confirm that your date and time is still open when booking! What your session includes: This promotional Mini Session Includes a 30-minute session for your child(ren). You will receive 10 high-resolution digital images of your choice. You will be able to pick your favorite images from an online gallery, and it will be available for download. You will also receive a print release. Additional images can be purchased at $10 each. No prints are provided. If you have questions please contact me BEFORE booking your session. MINI SESSION FEE: The mini session fee includes an optional pre-session consultation via phone or email to cover details in advance, 30 minutes of the photographer's time and talent at the studio, and retouching of your final images. Full payment of the session fee is due at the time of booking and guarantees your appointment time. Please submit the session fee payment along with these forms as soon as possible. Session fees and retainers are non-refundable. Please be on time for your session. PAYMENT: Cheryl Logan Photography shall reserve the date and time agreed upon, and not make any other reservations or accept any other clients for said date and time. For this reason, in the event that the client cancels the contract (session) for any reason, all monies paid shall be retained by Cheryl Logan Photography in order to offset its loss of business. There are no refunds for mini sessions. EXCLUSIVE PHOTOGRAPHER: Only bring those people being photographed for the session. There is no other photography allowed from family and friends during the portrait session. COPYRIGHTS: the photographs produced by Cheryl Logan Photography are protected by Federal Copyright Law (all rights reserved) and may not be reproduced in any manner without Cheryl Logan Photography explicitly written permission. A print release is provided for this session. DIGITAL FILES: The CLIENT understands Cheryl Logan Photography still owns the copyright to all photos that are downloaded. The photos must not be edited, cropped or change in any way without written permission from Cheryl Logan Photography. Photos are to be used for personal use only. The CLIENT accepts all responsibility for archiving and protecting the photographs. It is CLIENT'S responsibility to make sure that digital files are backed up and saved. Cheryl Logan Photography does hold images for 1 year and charges a $25 archival fee to relist old galleries. MODEL RELEASE: I hereby give Cheryl Logan Photography the irrevocable right to use my picture, portrait, or photograph in all forms and in all media and in all manners, without any restriction as to changes or alterations for advertising, trade, promotion, exhibition, or any other lawful purposes, and I waive any right to inspect or approve the photograph(s) or finished version(s) incorporating the photograph(s), including written copy that may be created and appear in connection therewith. LIMIT OF LIABILITY: In the unlikely event that the photographer is injured or becomes too ill to photograph the session, the studio will make every effort to secure a replacement photographer unless otherwise specified by the client. If the situation should occur and a suitable replacement is not found or accepted, a reshoot will be scheduled for the next available time slot. In the unlikely event that photographs have been lost, stolen, or destroyed for reasons within or beyond studio control, studio liability is limited to the return of all payments received for the portrait session. The limit of liability for a partial loss of originals will be a prorated amount of the exposures lost based on the percentage of the total number of originals. In the event of a dispute, the client agrees to arbitration. I have read and understood the terms above. I hereby agree to the terms of this agreement. 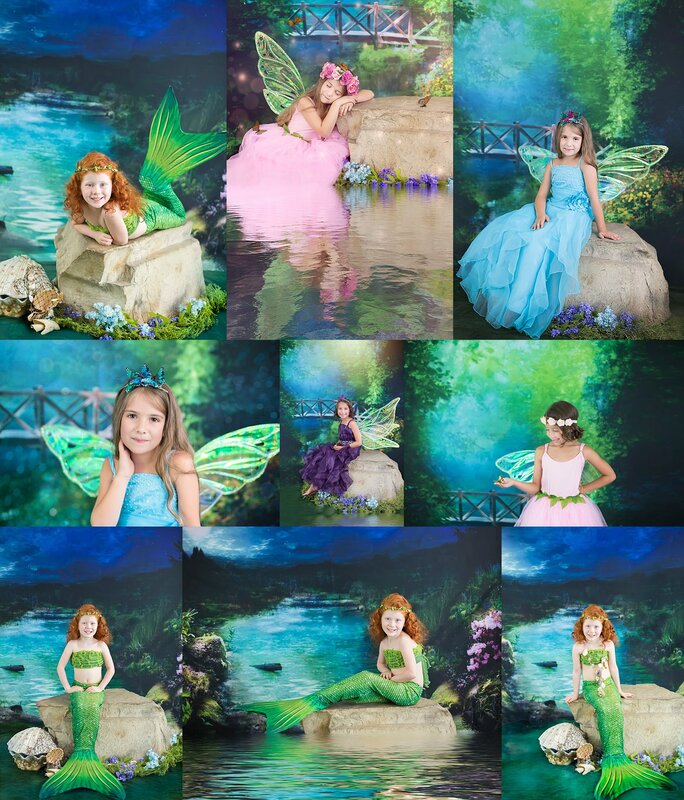 I have realistic wings, dresses, and mermaid tales in green, pink, and purple! Signature (By signing I agree that I have read all contractual terms and understand what comes with my session. I agree to abide by all terms set out by Cheryl Logan Photography.